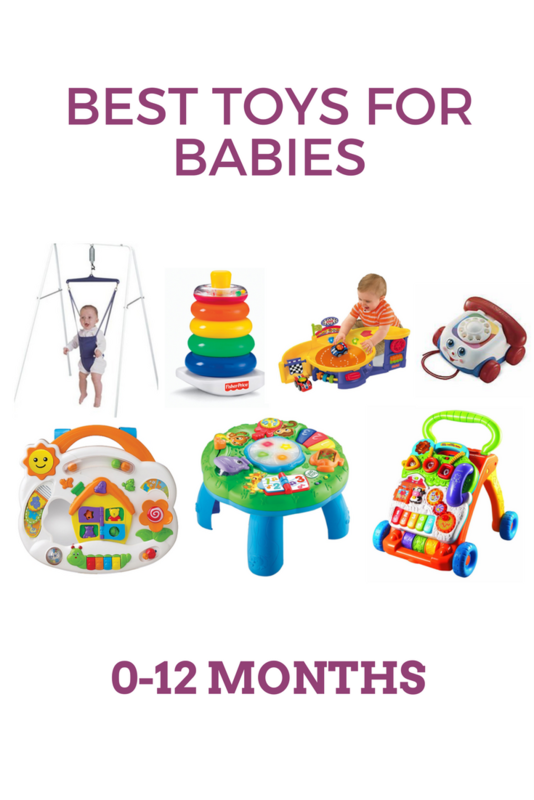 Here is a list of the toys that got the most play time at our house during S' first year. I've already started my Christmas shopping, so maybe this list will be helpful if you are buying for a little one. 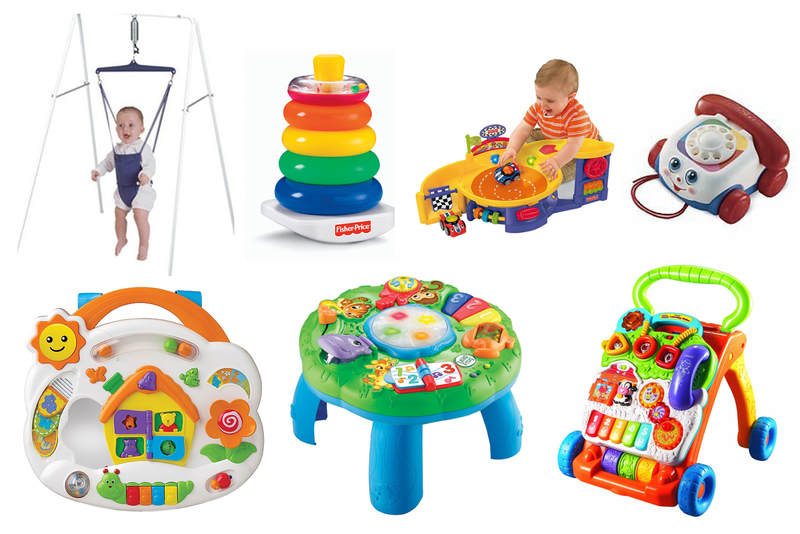 We were able to borrow an activity gym/playmat and an exersaucer from friends to save some $. I'd really recommend doing the same for these two toys because they are only used for 6 or 7 months tops. Jump baby Jump! OMG the Jolly Jumper. S lived in this thing from months 4-8 until he physically grew too tall for it. I'd put him in, turn on Gangnam Style and let him go. It was amazing. Hands down his favourite toy as a baby. Even when he grew too tall to really jump, he taught himself how to just swing in it. Hilarious. Also, like the playmat and exersaucer above, we borrowed a walker from a friend. Not only does it save $, but in the end, it does lower the amount of baby 'stuff' you have to store. 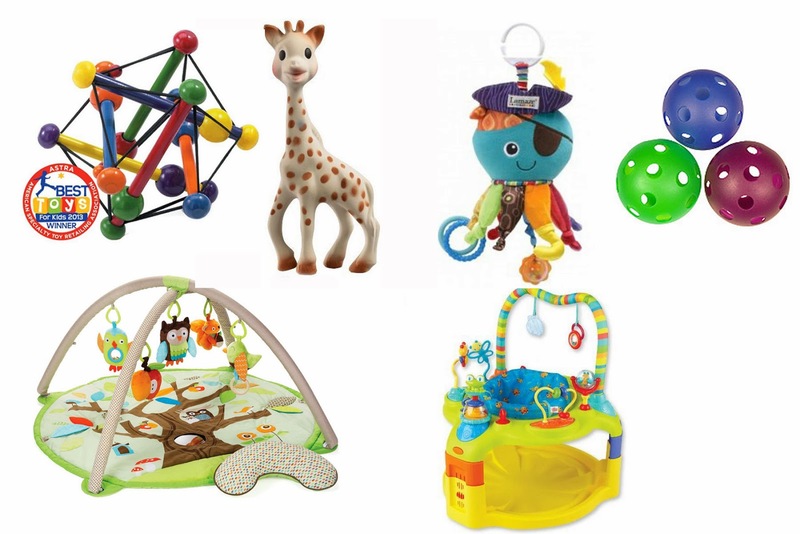 Stay tuned for a whole other post on the best books for babies, but they are absolutely to be included in the "toys that get play with" section. S loved 'feely' books. Any kind of book that had textures in it was a hit at our house. And board books are a must. S is perpetually teething, and he will actually chew the corner right off a book if we're not paying attention, so his books need to be durable. Know of any other 'must have' toys for babies? Add them to the comments section below!